Since releasing the results of the Greater Baltimore Exposed Soil = Pollution Survey last week, I’ve received a number of messages from folks who do not understand why citizen involvement is essential to achieving a high level of compliance with Clean Water laws like erosion-sediment control. The following true story shows why public support is essential to ensuring enforcement agencies have the resources needed to be effective, then creating a political climate where the agencies are allowed to enforce. The success described below was not a fluke. It has been repeated many times. Now the challenge is to increase citizen involvement in all Clean Water law enforcement efforts in every watershed if we are to fully restore the Bay and the 57% of her freshwater tributaries that are unfit for our use (red-orange watersheds in map). In the mid-1980s I was the director of Maryland Save Our Streams. Anne Arundel County SOS was headed by two incredible advocates: Peg Burroughs and Lina Vlavianos, both of whom were deeply concerned about poor construction site erosion and sediment control. After each major storm they were getting complaints from SOS volunteers throughout the County of muddy creeks. Though we suspected construction sites were the major culprit, we lacked the facts to support this suspicion. So, Lina and Peg recruited 50 volunteers who participated in a two-hour training session one Saturday morning. The volunteers then formed two-person teams and each team was assigned two major construction sites to survey. A week later the volunteers met to share their findings. They reported that only 21% of the 50 sites surveyed had good erosion and sediment control. The results were released to newspapers and other media who widely reported these alarming findings. This placed considerable pressure on the County Executive, who responded by doubling the number of sediment control inspectors from the existing six to twelve. At that time, Anne Arundel County probably had the largest local sediment inspection staff in the nation. About six-months later Lina and Peg did something the County had not anticipated. They repeated the survey. They called together the original 50 volunteers, repeated the two-hour training, then asked the teams to go out and survey 50 new sites – not the same ones visited six months before. A week later they gathered to share their findings. After doubling the enforcement budget the portion of sites with good erosion and sediment control went from 21% down to 17%! Yes, the quality of control had actually grown worse! After the media got hold of this there were calls to impeach the County Executive. But cooler heads prevailed and the County Executive took the additional step he should’ve in the first place; he brought in a very skilled administrator to determine why enforcement was so poor and to develop fixes. About six months later the administrator got wind that Peg and Lina were about to conduct a third survey. The administrator had been working closely with the two advocates allowing a pretty good relationship to develop. This made it possible for him to ask Lina and Peg to consider holding off on the survey. The administrator explained that a number of improvements had been made, but more work was needed to ensure the higher level of compliance would be lasting. The administrator asked the advocates to hold off the third survey for three more months. Peg and Lina found this reasonable and agreed. Third Survey Finds Four-Fold Improvement! Fifteen months after the first survey Lina and Peg called the 50 volunteers together again. By this time the survey had become so popular they had to turn lots of folks away. But they wanted to stay with the original 50 volunteers. After refresher training, the two-person teams set out to look at 50 new construction sites. A week later the volunteers reported that after nine months of no new funds, no additional inspectors and no new laws, the portion of construction sites with good control had risen from 17% to 61% – a four-fold improvement! Why Did Control Quality Decline Then Improve? We believe the old inspectors were training the new inspectors to use the same ineffective approaches for encouraging compliance. So there was actually less inspecting going on using the old weak enforcement measures. This may have accounted for the decline from 21% compliance to 17%. The administrator saw the problems very quickly and modified inspection procedures. Both old and new inspectors were required to follow a new written protocol that began with informing construction site owners of problems, describing how to fix the problem and setting a date by which correction had to take place. If compliance was not achieved by the target date then the inspector was required to pursue enforcement action beginning with the mildest, then quickly escalating. Supervisors worked very closely with each inspector to ensure they understood the protocol and were making full use of each element to attain more reasonable compliance levels. But most important of all, the County Executive and County Council made it very clear that a higher level of compliance was a top priority. As the third survey showed, these and other improvements worked. An extremely important lesson from the Anne Arundel campaign was that increasing enforcement budgets does not necessarily result in greater compliance. Though the 2014 survey showed that at least one Greater Baltimore jurisdiction is in desperate need of more sediment inspectors, I would argue against a budget increase as an automatic first step in fixing an ailing enforcement program. Instead local elected officials must make it clear to enforcement staff that a high level of Clean Water law compliance is a top priority. The inspection staff must then be given the tools (fines and other penalties) needed to achieve greater compliance along with the freedom to use these tools. Inspectors who then achieve improved compliance should be rewarded while those who fail should receive additional training before being discharged. I have known many people who work for Clean Water enforcement agencies. All but a few were dedicated, competent and very conscientious. I have found that their inability to achieve higher levels of compliance is far more likely a result of poor support from their elected superiors as opposed to laziness or incompetence on the inspector’s part. But I don’t think neglect from superiors is always intentional. It may simply reflect the fact that elected officials are far more likely to take heat for schools, police, fire and other public services when compared to environmental protection. Or put another way, the public is far more likely to notice when class size grows, police response times decline or water pressure drops. Unless there’s someone out there monitoring Clean Water law compliance the public has no way of knowing the reality. This is another way of saying that we need a dramatic increase in the number of volunteers and watershed groups assessing compliance levels and educating the public so the agencies have what they need to enforce. So, take a note from Peg and Lina’s playbook and do what they did when Anne Arundel achieved a 61% compliance rate: Hold a thank-you party for the County Executive, the County Council and the inspectors. I wish I could say that the improvements won in the 1980s can still be seen today. Alas, Anne Arundel County was not found to be the best of the six Greater Baltimore jurisdictions during the 2014 survey. 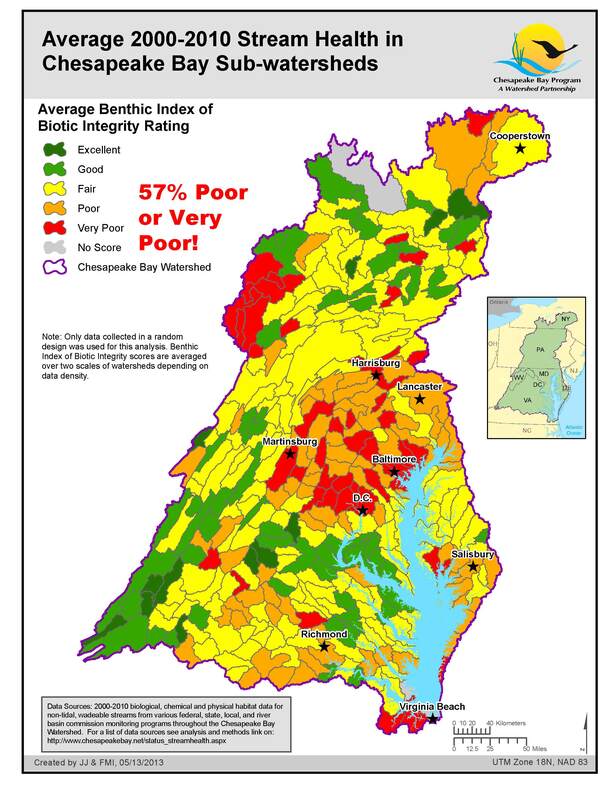 In fact, the County was ranked quite low by both the citizen survey and the Maryland Department of the Environment. Fortunately, improved compliance can be maintained if citizens repeat these campaigns about once every two- to four-years, say in time to release results just before primary elections. Poor compliance is not restricted to erosion and sediment control, but appears to plague just about all the laws we depend upon to protect and restore the Chesapeake and her 100,000 miles of tributaries. While citizen action like the Greater Baltimore Survey is not a panacea, the approach used in the survey can be modified to gain an independent assessment of how well most other Clean Water laws are being enforced within a township, a city, a county, a watershed or even statewide. But for reasons that I do not understand, most watershed organizations do not pursue this essential form of advocacy. Maybe this is due to a lack of funding, in which case I urge the Chesapeake Bay Funders Network to make a call for proposals to carry out this type of action. Further detail on how to conduct these surveys can be found at the CEDS Watershed Audits webpage.